Learning to listen to your body’s cues can help point you toward a balanced way of eating that’s right for you, says dietician and Yoga teacher Sat Hanuman. 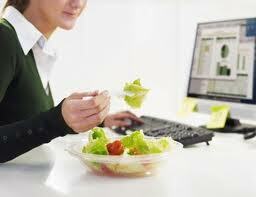 The lead nutritionist says that eating right starts with bringing conscious awareness to the table. Slowing down and tuning in to all five senses will help you develop an approach to eating that supports your well-being. “we don’t teach or prescribe one diet. We teach the practice of paying attention to how a particular food or way of eating makes you feel,” says Hanuman. “It’s a practice. And we become better at discerning the body’s messages with practice.”So, rather than resolving to stick to a new diet plan, why not practice observing and listening to your body? Here are five tips for intuitively eating well. Slowing down and consciously chewing your food has myriad benefits: It can improve digestion, reduce mindless munching in front of the TV or the computer, and discourage the impulse to take a shortcut with processed food. Instead, you’ll find yourself experiencing new flavours and observing your reactions to them—the vegetal bite of leafy greens, the juicy sweetness of a raw carrot, the sharp bite of a fresh radish. “It’s a practice of learning to use your senses again,” Hanuman says. Hunger is a biological urge with attendant physical sensations: Your stomach rumbles, your energy dips, perhaps you even get irritable. But it’s easy, particularly if you’re in the habit of eating when you’re bored or stressed, to lose touch with what hunger actually feels like. Reconnecting with the sensation of physical hunger is a crucial element of eating with conscious awareness, says Hanuman, and one that requires the ability to distinguish emotional cravings from physical messages of need. Hanuman recommends developing a habit of asking yourself before you reach for a snack: “Am I famished? Moderately hungry? Or am I bored, nervous at this party, or frustrated after my workday?” This initiates what he calls a“body-based inquiry” that puts you in touch with what your body is telling you it needs. As you slow down and begin to pay more attention to what and when you eat,it will become easier to differentiate a craving from a message your body sends to tell you “This is a supportive food,” or“This food may or may not work as well,”Hanuman says. For example, when the cold months hit, you might find yourself gravitating toward warm, filling fare such as soups, stews, warm grain salads, and sweet root vegetables. But what about those times when what you’re craving is chocolate layer cake or pizza? Should you get into a situation when you’re overeating all this beautiful, rich food in the wintertime,” Hanuman says, “it’s an opportunity to step back and say,‘Oh, am I not a fascinating being? Look at what I’m doing; I wonder what that’s about,’ and approach the episode not as a failure or as ‘bad,’ but just as ‘Here’s another fascinating facet of my being.’ ”treat your cravings with compassion. Many Eastern cultures practice the tradition of eating just until gently satisfied. In the Japanese culture, it’s called “harahachi bu”. In yoga, it’s mit-ahara, or eating lightly. In Ayurveda, the rule is to fill the belly one-half with food and one-quarter with liquid, leaving the remaining quarter empty. But Western culture offers fewer guides to eating moderately. “Moderation is acknowledged as a good thing to have and maybe essential for health, but we just don’t hear much about how to be moderate,” says Hanuman, who suggests experimenting with what it feels like to eat moderately by leaving a little food on your plate. When it comes to eating consciously, just as important as the awareness you bring to the process of eating a meal is the care and attention you give to preparing it. When she teaches a meditation for conscious eating, Hanuman begins with selecting and preparing the food. Choose something simple, he suggests—like a sandwich, a salad, or even a piece of fruit. Pay attention to the colours and textures of the fresh ingredients as you rinse lettuces for a salad, peel an orange, or use your hands to coat vegetables with oil before roasting. And think about the honour you’re doing both the food and yourself with your attention.